I wrote a book. And this is it. Simply Stitching - Your No-Fuss Guide to Colourful Embroidery. It is a combination of my two ebooks, Small Stitches and Stitching Borders and Beyond. The Small Stitches part has been re-stitched and re-photographed. Plus there's a section with all new stuff about tools and techniques. And a couple of extra patterns for good measure. And it's not an ebook! It's a proper printed book with a shiny cover and everything! It is only available as a print on demand book through the Blurb site. (Although it will be available as an ebook eventually, but that's a different story). Man, a lot of hours have been poured into making this book a reality. And it's all done by me. I'm not sure I would have done it if I had realised just how long it would take. 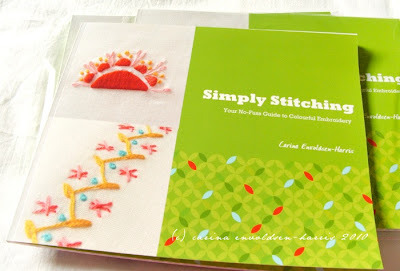 I mean, who writes, stitches, photographs and designs a book all by themselves?! Crazy people, that's who! Here's a page from the book. If you fancy seeing more pages, there is a preview widget over in the sidebar. The preview is quite small but you can view it in fullscreen mode too. Or you can click over to the book's Blurb page to have a look. The book is £16.49 + shipping in the Blurb store, but I can buy it in bulk and save about 10% off the 'factory' price, making the book about £3-4 cheaper. But I need to buy more than 10 to get the bulk discount. If you are interested in buying the book from me (I'll even sign it if you like..) please get in touch.